(CNN) - Republicans wasted no time Monday pouncing on President Barack Obama's now-controversial "open-mic" comment with Russian President Dmitry Medvedev. The video features the clip of Obama and Medvedev holding a private conversation at the Nuclear Security Summit in Seoul, South Korea. During their talk, which was caught on camera and on microphone, Obama asked his Russian counterpart for some "space" on the U.S.-led NATO missile defense system in Europe. "This is my last election," Obama told Medvedev. "After my election I have more flexibility." While Obama put his hand on Medvedev's arm, the Russian president responded saying he would transmit the information to the incoming president, current Prime Minister Vladimir Putin. But Republicans seized on Obama's request as an opportunity to frame the president as a politician primarily focused on re-election. "It's amazing what we find out about this president's policies when he thinks no one is listening and it begs the question: What else doesn't Obama want us to know about before he's reelected?" Kirsten Kukowski, RNC spokeswoman, said. Republican presidential candidate Mitt Romney also came out against Obama's comments, saying the moment represented "an alarming and troubling development." "This is no time for our president to be pulling his punches with the American people. And not telling us what he's intending to do with regards to our missile defense system, with regards to our military might and with regards to our commitment to Israel and with regard to our absolute conviction that Iran must have a nuclear weapon," Romney said while campaigning in San Diego. His team launched a new Twitter campaign Monday, highlighting the president's remark. From his Twitter account, Romney asked followers to fill in the blank: "@BarackObama: I'll have more flexibility to ______ after the election." 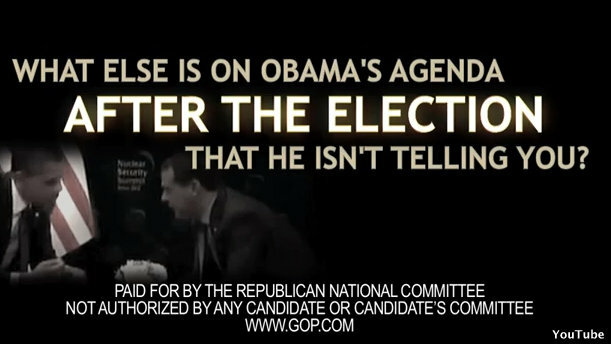 Pushing back, the Obama campaign said Romney was distorting the president's words. "Governor Romney has been all over the map on the key foreign policy challenges facing our nation today, offering a lot of chest thumping and empty rhetoric with no concrete plans to enhance our security or strengthen our alliances," Ben LaBolt, the campaign's press secretary, said in a statement. "Instead of passing the buck, it is time that Governor Romney shared his foreign policy agenda with the American people." - CNN's Paul Steinhauser, Brianna Keilar and Rachel Streitfeld contributed to this report. Lies and nothing but lies is nothing more than a stepford wife that regurgitates everything her hubby tells her to, that he heard on Faux News. What's the problem here? It will be his last election,and like every other second term President he will have more fllexiblity, ESPECIALLY if we give him the Senate AND the House. Maybe the GOP is suffering fromt he second-term flashbacks tht their impotent Shrub provided us with when he flushed the toilet twice for good measuere on the middle-class, and the economy before scurrying out of the White House like a rat. ""This is no time for our president to be pulling his punches with the American people. And not telling us what he's intending to do with regards to our missile defense system, with regards to our military might and with regards to our commitment to Israel and with regard to our absolute conviction that Iran must have a nuclear weapon," Romney said while campaigning in San Diego. ".........................................in the meantime, WHAT specifically is Romney's plan for America regarding the above? And still yet, what is the R.N.C. plan? No one knows in America because neither of them have a "plan". Who cares what's the big deal, sounds like a conspiracy to who? Obama wants Russia will win over America. Oh yeah, Russian news anchor disliked Obama, few months ago. Then Obama will lost to her. OK, so the President is "Caught" off mic, STATING THE OBVIOUS....any president facing reelection is facing the same dynamic. You don't have to worry about things like your political base and wooing independents when you are governing without the shackles of an impending reelection campaign. what the hell is the big deal? Oh, yeah, the FOX FEAR MACHINE must keep turning.......what's Obama gonna do after he's reelected. COME AFTER YOUR GUNS!! COME AFTER YOUR BIBLES!! Overrun the country with Communists and muslim extremists. This crap is all so tiresome. Most Americans with brains and a sliver of education pay no attention to it. Whoops! the country is getting increasingly distracted and stupid by the hour. Of course liberals will defend their liar and cheat president from Obama's own sell out America agenda. They hate this country because they can't push their misguided agenda unobstructed and have to respect all Americans even those like Perry with misguided ideas. These liberals are so pretentious of they can’t stand hear otherwise and are worse attack dogs then Fox News. .
What a scandal. Something any first year poli sci student could tell you. Obama's second term will absolutely include tax increases for all American workers. His strategy is already working. Look how easy he got his followers to scream for higher taxes that he says billionaires need to pay. So many people just jumped right up on that bandwagon it wasn't funny. After all, who cares about billionaires? The funny thing is that without even skipping a beat he will point out that really the lower income levels are paying such a small percentage that they need to step up and pay their " Fair Share". His Chief Economic Adviser has already talked about this. But it is nothing Obama will make a Prime Time Speech about. Not before November. I love a good conspiracy theory, but this is nothing. Obama seems cool on the surface, but we know he has an agenda. Every president does. So you trust them to a point. Everybody knows that, when re-elected, he will do as he pleases. Just like Bush did. No big secret here. Thats the whole Idea behind gettin re-elected. When you run in the primaries you are far left or right, in the general you move to the middle, once elected you move back to the right or left (for the first 2 years), then back to the middle the second 2 years. Then you get re-elect for the final 4 years for the purpose of getting to stretch out, show your true colors, and really be yourself. Just like the liberals to always protect their messiah as he can never do no wrong. Obama i will be voting for you again dont people see and know that Bush left this country in a mess its going to take more then 4 years to staight out this country.Obama is a people president that is getting things done peacefully as he can we need to stop complaining and start helping him and praying in God we trust people you get RS up there the he is going to help his people the hispic look what happen already a innocent child go shot down.May God Bless America and the people. Obama's promises of transparency have turned out to be a complete betrayal. Like Hugo Chavez, Obama exploited democracy, to get elected, but once in power, he is systematically removing oversight, accountability, citizen's rights, and freedoms ... all of which are guaranteed in our constitution ... which Obama is trashing. If Obama gets a second term, America will soon be living in a dictatorship, just like Venezuela.